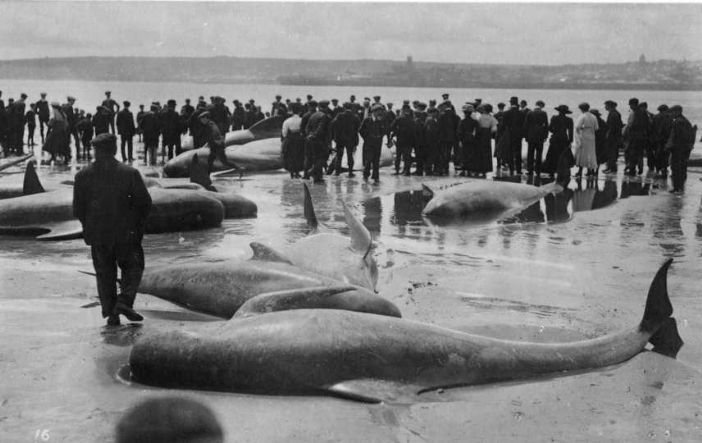 On August 10th 1911 the Cornish Telegraph reported the stranding of whales at Penzance - actually to the beach on the eastern side of the town, towards Long Rock. In itself, this was nothing new. One large whale had been stranded here back in 1835, either dead or dying, and had eventually been acquired by a local person who had it hauled to the baths at the bottom of Jennings Street to be cut up in order to retrieve the skeleton, which, when cleaned up, was put in the museum which at the time was in the dome above Penzance market house. Nor was it new generally. Such strandings have been recorded all over the world for many centuries. 7th century Irish laws for example, usually banned the eating of carrion, except ‘Marine animals cast upon the shores, the nature of whose death we do not know, are to be taken for food in good faith, unless they are decomposed’. Other animals, such as dolphins have also been found on shores in many places but it is their size, and often the large number of beached whales which attract the most attention. To early populations such events could be seen as lucky, since not only was there the possibility of free food, but of other parts of the whale which could be useful. To later people, by the 16th century, whaling – actively searching for and killing whales at sea – was well under way in several European countries including Britain. This was not the efforts of small coastal communities to acquire food for themselves, but a large, well organised, financed and competitive industry, with fleets of ships returning from the most distant seas, with whale products such as oil for lamps, in great demand until the development of gas lighting, and later on, for margarine. People in 1911 would have been well aware of this. British whaling did not stop until 1963 by which time factory ships and powerful guns had decimated the numbers of whales left in the world. The stranding in Penzance in 1911 is especially interesting in that it demonstrated the ambivalent attitudes to whales at the time. Since Linnaeus (18th century) it was accepted that whales were mammals but in the minds of many were still just sea creatures and therefore much inferior and also had a commercial value so could therefore be harvested. Their sentience was doubted, else why would the whales be so stupid as to constantly throw themselves on shore? However in 1911 many of the spectators felt sympathy for the huge animals and tried to encourage them back into the water, even pouring water on them as the sun became hot. They were horrified when a number of youths were seen cutting off tails or skins and carving their initials into a whale when it was still apparently alive. Complaints brought the police and council officers to the scene and three of the young men were arrested and charged with cruelty. In the magistrates’ court the argument on their behalf was that someone was already shooting the whales to put them out of their misery, and that this person, said to be a Lieutenant, had given them permission to use knives to do the same. This was unconvincing, bearing in mind the size of a whale compared to the small pocket knives being used, and there was also evidence that at least some of the youths were drunk. Not only local people, but those all over the country who were now reading the story in their local newspapers, joined in the feelings of disgust and hoped the accused would be sentenced heavily for their disgusting cruelty. The magistrates clearly agreed but a considerable legal problem had arisen. The law at the time protected only those animals that were in captivity from being treated badly. Defending counsel argued that whales stranding themselves, and often refusing to escape, could not be described as in captivity. Agreement on this proved so difficult that the magistrates eventually had to dismiss the case, but agreed that they would answer if an appeal was made. The RSPCA did so a few months later, but the Appeals court upheld the magistrates’ decision (see OTD Jan 19th). It is remarkable that today, over 100 years later, the apparently voluntary stranding of whales continues unabated all over the world and despite research, the reason or reasons are unknown. Public attitudes of compassion have become widespread and frequently make headlines, with photographs of local people making huge efforts to carry the whales back to the sea and drive them away from the shore. Local authorities are less than pleased when whales strand themselves since it is their responsibility to deal with the carcases. A recent stranding of just a few whales in Scotland cost the local council over £50,000 to clear the beach. The law is still complicated today although The Wildlife and Countryside Act of 1981 does make it an offence to intentionally kill, injure or take any cetacean and there are other, supporting agreements from, for example the European Union. Whaling is almost extinct, with the one or two countries still practising it, being heavily criticised by world-wide opinion, which holds that whales are amazing and fascinating animals, with large brains and powers of communication, and that we have lost enough already.